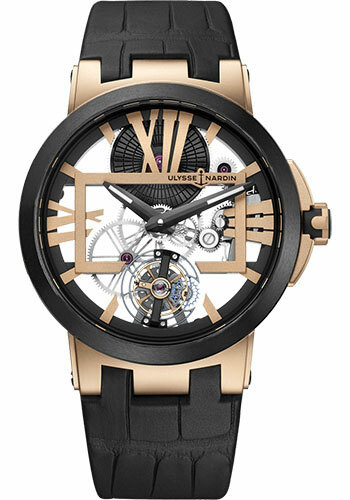 45 mm 18K rose gold case, ceramic bezel, sapphire crystal, Caliber UN-171 manual-winding movement with flying tourbillon, Exceptionnal power reserve of 170h, silicium technology, leather strap, folding buckle. Water resistant to 30m. 45mm titanium case, screw-down security crown crown, ceramic bezel, sapphire crystal, Caliber UN-171 Manual-winding movement with flying tourbillon, exceptional power reserve of 170h, leather strap, carbon structure and folding buckle. Water resistant to 30m. 45 mm titanium case, ceramic bezel, sapphire crystal, Caliber UN-171 manual-winding movement with flying tourbillon, exceptional power reserve of 170h, silicium technology, leather strap, carbon structure folding buckle. Water resistant to 30m. 43mm titanium case, screw-down security crown crown, ceramic bezel, sapphire crystal, Caliber UN-171 Manual-winding movement with flying tourbillon, exceptional power reserve of 170h, leather strap, carbon structure and folding buckle. Water resistant to 30m. 45 mm titanium case, ceramic bezel, sapphire crystal, Caliber UN-171 manual-winding movement with flying tourbillon, exceptional power reserve of 170h, silicium technology, leather strap, folding buckle. Water resistant to 30m.